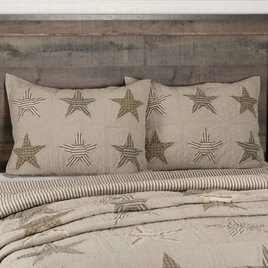 You've found your new farmhouse style with the Sawyer Mill Red Bedding Collection. 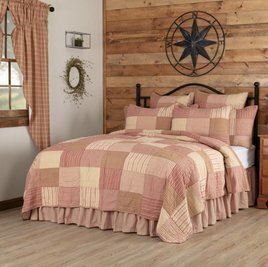 Simple block pattern in various plaid and stripes in Country Red, Dark Tan, Dark Creme. Available in Twin, Queen, King, Luxury King & California King. 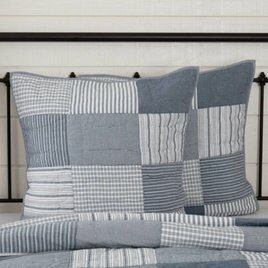 The Sawyer Mill Blue Quilt adds a delightful, relaxed, farmhouse touch to your home featuring vintage stripes, microchecks, & blue chambray coordinated in a simple block layout. Reverses to a ticking stripe in blue & white inspired by a vintage fabric. 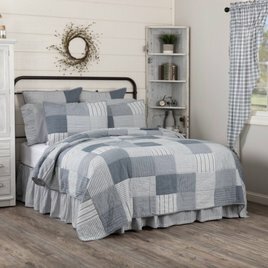 The Sawyer Mill Blue Sham features echo hand quilting with denim blue & soft white to bring an extra layer to your farmhouse style. rimmed a.5 bias cut of black and creme micro plaid. Reverses to dark creme & charcoal grain sack stripe & 3 tie closures. Sawyer Mill Blue Windmill Blade Pillow brings a Farmhouse style anywhere it is displayed. 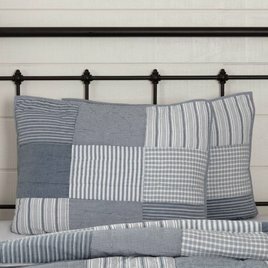 Features grain sack stripes with "Sawyer Mill Farms, Family Owned 1928" stenciled in soft white on denim blue chambray. 100% cotton chambray fabric. 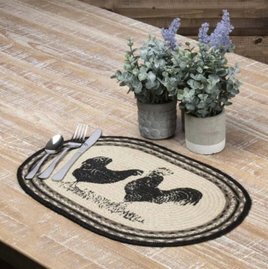 The Sawyer Mill Poultry Jute Oval Placemat is a great " farm to table" addition to your home. 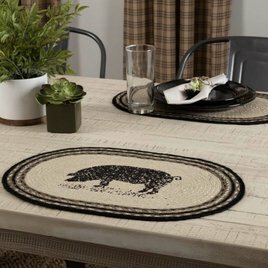 Each placemat has a rooster and hen, both stenciled in distressed black over ivory & surrounded by concentric braids of black, grey taupe, silver, & ivory. The Sawyer Mill Blue Family Pillow is the perfect addition to your farmhouse style home. Features strip patchwork in alternating denim blue, soft white fabrics containing the word "Family" appliqued in matching white felt.